Top of the Range Drysuit for Extreme Conditions with a 3 Year Warranty! The PS330 Xtreme is the culmination of several years research into making suits to cope with the most extreme conditions found in the worlds oceans. 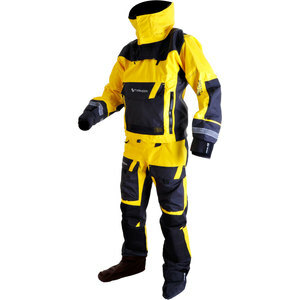 The prototype designs and fabrics were tested in the harshest of environments including the Volvo Ocean race, the Sydney Hobart, powerboat circumnavigations of the British Isles and Xtreme Sea kayaking in the Arctic, in order to produce the best possible combination of Durability, Performance and safety. The result raises the bar on what sailors and Kayakers can now expect from their drysuit, as well as providing a vision of extreme dry clothing of the future.